Extreame Savings Item! 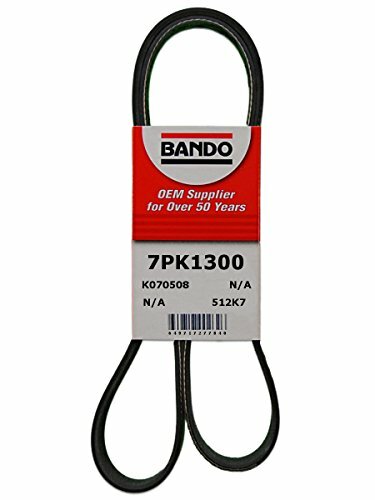 Save 45% on the Bando 7PK1300 OEM Quality Serpentine Belt by Bando at Zona Indonesia. MPN: 7PK1300. Hurry! Limited time offer. Offer valid only while supplies last. Bando has been manufacturing rubber products for over 100 years. Bando is the OEM suppliers to over 80 percentage of the top 10 cars sold in the U.S.
Bando has been manufacturing rubber products for over 100 years. Bando is the OEM suppliers to over 80 percentage of the top 10 cars sold in the U.S. (by volume). As an OEM belt manufacturer, the serpentine belts are precision ground two times to insure adherence to OEM specification. Belts produced from a mold process will not achieve the exact rib profiles that are required by OEM suppliers. Bando belts are made with EPDM rubber which adheres to OEM specification which is more heat resistant and long lasting. With 19 plants worldwide, Bando is the 3rd largest manufacturer of automotive drive belts in the world. Bando USA manufactures belts in Bowling Green, Kentucky. All Bando belts are produced to one premium set of standards with only OEM quality. They manufacture power transmission belts for the automotive, industrial as well as agriculture providing complete coverage for domestic, import and light truck. Bando USA, with an ISO and QS9000 certified plant in Bowling Green, Kentucky has 16 additional plants located in 10 countries producing belts for local OEM. Automotive belts, serpentine, timing and V-belts from Bando are engineered to meet the unique requirements of high performance engines for applications that run the gamut from international racing teams to light duty trucks. Bando manufactures belts for the leading automakers, supplying both OEM and aftermarket applications, all to the same exacting standards of quality. If you have any questions about this product by Bando, contact us by completing and submitting the form below. If you are looking for a specif part number, please include it with your message.